The 2005 issue of 1/4 oz Proof Gold American Eagle coins was notable for this weight in a number of ways. In one respect, it was a great year as mintage increased by one of the largest margins in this weight in recent memory. Unfortunately, it was also the last year the 1/4 oz Proof Gold Eagle would prove among the more popular options in the series. The 2005 1/4 oz Proof Gold American Eagle Coin is currently available to you for online purchase at Silver.com in perfect condition. Ships to you inside of an NGC protective plastic slab! 18th release year of the 1/4 oz weight in the Proof Gold Eagle! Availability limited within the original 37,027-coin mintage! Consists of One-Quarter Troy ounce of actual gold content. Issued a face value of $10 (USD) by the United States. The reverse features American bald eagles. From its introduction in 1988, the 1/4 oz Proof Gold Coin had proven as popular or more popular than the 1 oz gold coin. The only coin it would never surpass was the 1/10 oz coin, but it was always a popular choice. In fact, from 1988 to 2005, the 1/4 oz coin was surpassed by the 1 oz coin just two times. In 2005, the 1/4 oz Proof Gold American Eagle maintained its position as the second choice among collectors of Proof Gold Eagles. It would be the last year however it would enjoy this status, as it would be surpassed by the 1 oz coin in years to come. On a bright note for the year though, 2005 1/4 oz Proof Gold American Eagle mintage increased by 8,368 coins. This is the largest year-over-year increase ever in the history of the 1/4 oz weight. On the obverse face of 2005 Proof Gold Eagles is the image of Liberty created in 1907 by Augustus Saint-Gaudens for the $20 Gold Double Eagle. The reverse of 2005 1/4 oz Proof Gold American Eagle coins includes Miley Busiek’s depiction of a family of bald eagles around their nest. 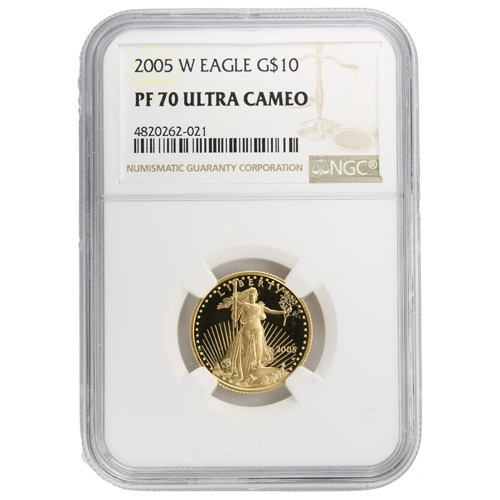 All 2005 1/4 oz Proof Gold American Eagles in this listing earned PF70 certifications from the NGC. These coins have full, original mint luster with no detracting flaws. You’ll notice the coins also have strong, frosted designs and deeply-mirrored, clear backgrounds. This is the reason for the UCAM label. We encourage Silver.com customers to contact us with questions at 888-989-7223. You can also connect with us live online using our dedicated chat service or email address features.